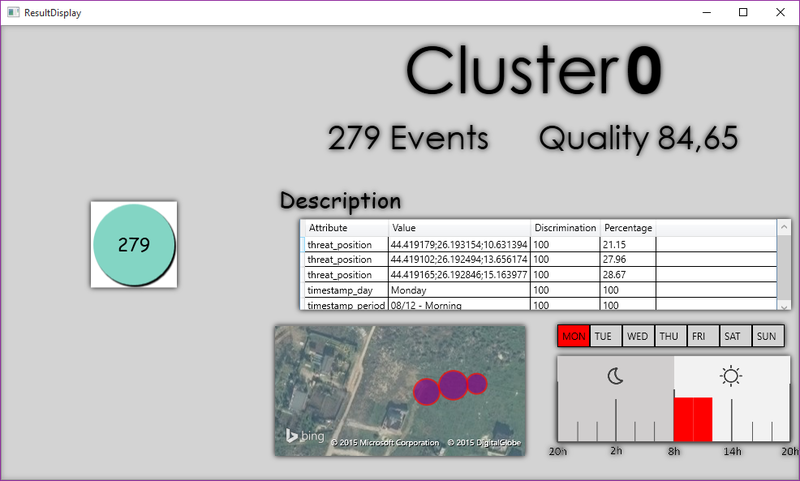 Clustering is one of the most used techniques in the Data Mining field. Its objective, in ARGOS project, is to help analyzing existing data by subdividing these data into a small number of clusters or (groups) where the events inside any specific cluster are very similar to each other and very dissimilar to the events of the other clusters. Each cluster is described by the most important attributes that participated to the grouping of its events. This leads to the discovery of the profiles of the "normal" events as well as the "abnormal" ones. 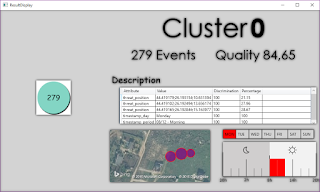 • no need to fix arbitrary the number of clusters to be found in data. This method has been applied in several fields (insurance, banking, video recordings, marketing, etc.). An example of its use in video recordings can be found in . H. Benhadda, J.L. Patino, E. Corvee, F. Bremond, and M. Thonnat. “Data mining on large video recordings”. Colloque V.S.S.T.2007 : Veille Stratégique Scientifique & Technologique, 21-25 Octobre, Marrakech, 2007. Mustapha Lebbah, Younes Bennani and Hamid Benhadda. “Relational Analysis for Consensus Clustering from Multiple Partitions”. Machine Learning and Applications. ICMLA 2008: Seventh International Conference. pp 218- 223. San Diego, California, December 11-13, 2008.